It's somewhat unsurprising that this particular 550A Spyder sold for more than we've ever seen one sell before. With factory werks provenance and an extensive list of famous races and drivers, this 550A has seen a long life of motorsport, and deserves the attention. With Andy Prill calling this among the three best Spyders in the world, the $5-million dollar final bid proves that this is one of the most expensive Porsches in the world. The world has gone absolutely mad. 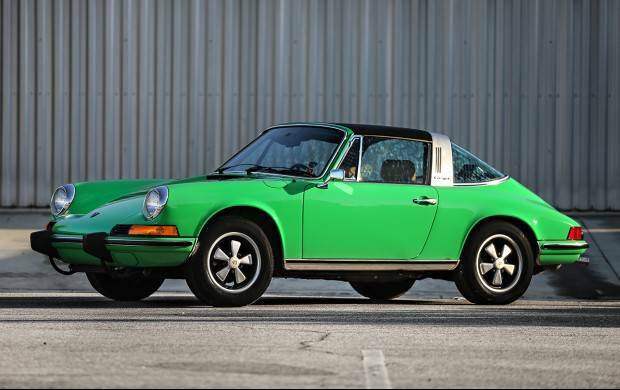 We're convinced that this non-running 1973 911T Targa selling for over $300,000 dollars is a sign of end times. Granted this is a 2400 mile all-original display car, but what's the fun in buying a car to never drive it? As Ferry Porsche once said, these cars are meant to be driven. Someone has purchased a very expensive paperweight. A nicely set up and US legal 959 has become a properly blue-chip Porsche investment car, and this simple-in-silver Komfort model proves that with a million-plus final bid. If you've been looking for an analog supercar with a Porsche badge, you're running out of time. Collectors are grabbing them all and chucking them away. Looks like things are stable. Certainly not robust, nor fleeting. Where it should be. …………………..Jim.